When new dogs arrive, we never know how it’s going to work out. We always kind of hold our breath, do our best at making the introductions as smooth as possible, and then see how things develop. Deaf Esther, our elderly Sheltie mix who arrived last year from an upstate New York’shelter, was really put out when blind Mabel showed up a couple of months ago. She just didn’t seem to like the fact that a new dog was here, and kept staring at Mabel with a look that seemed to say, “Now when are you leaving again?” To compound matters, although Mabel had her own favorite round foam bed — one in both the living room and the dog room — she eventually took a liking to the big fleece bed that was Esther’s favorite bed in the living room. It’s the white one in the photo above. Esther wouldn’t go anywhere near it if Mabel was on it, and she wasn’t even willing’to settle down on the other fleece bed right next to it. That wasn’t hers, you see. There was no shortage of beds in the living room, but that wasn’t the issue. So she sulked and pouted and wandered around the house, looking a bit lost and quite unhappy. Alayne would eventually scoop up Mabel and set her down in her foam bed, and Esther would go bounding back to her coveted fleece bed. This went on for weeks. Until July 11, when I noticed the two of them side by side on that same bed — and that’s when I took the photo above. It was one of those “ah ha” moments. I looked over and saw them there and couldn’t believe it. Silently, without us doing anything, somehow these two elderly ladies worked things out. They’ve been sharing that bed off and on ever since. An update on Esther: In mid-June I wrote a post about taking her off seizure meds because the drug, Keppra, had seemed to change her personality and diminished her zest for life, along with her appetite and energy. Well, several weeks later, I’m delighted to report that Esther has become her normal self again, bounding down the hall after?Alayne, eating dinner with gusto, and walking around with a smile on her face. She also hasn’t had another seizure so far, which is a relief. Now, I can’t blame for certain the Keppra for what happened to her — this is only correlation, not causation — but the results since’taking her off the medication have been quite dramatic. We’re happy to have her back! I understand your issues. I have 8 rescues total. 5 dogs and 3 cats. It’s always a tight rope act when someone new joins the pack especially if they have different needs. Also, I’ve found that “correlations” tend to be right about 99% of the time. Trusting your gut is always the way to go. Prayers! If you can’t lick ’em, join ’em. 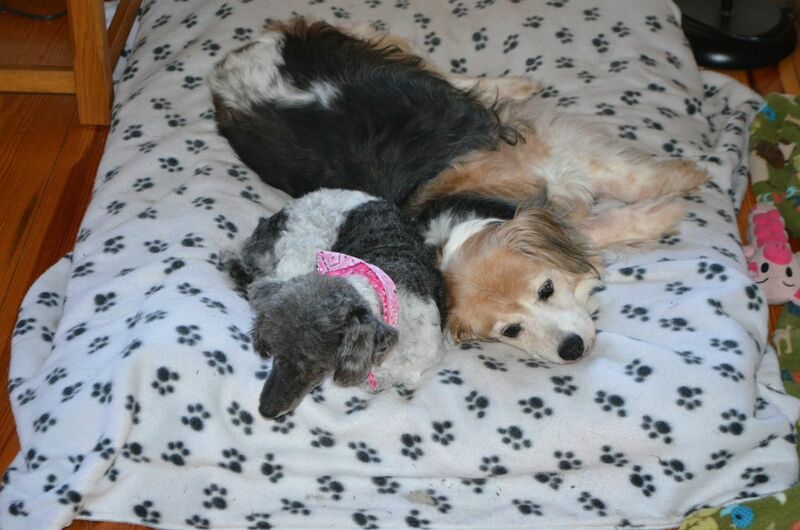 My guess is that one day, when Esther was on the bed, Mabel approached and curled up on the edge of it. 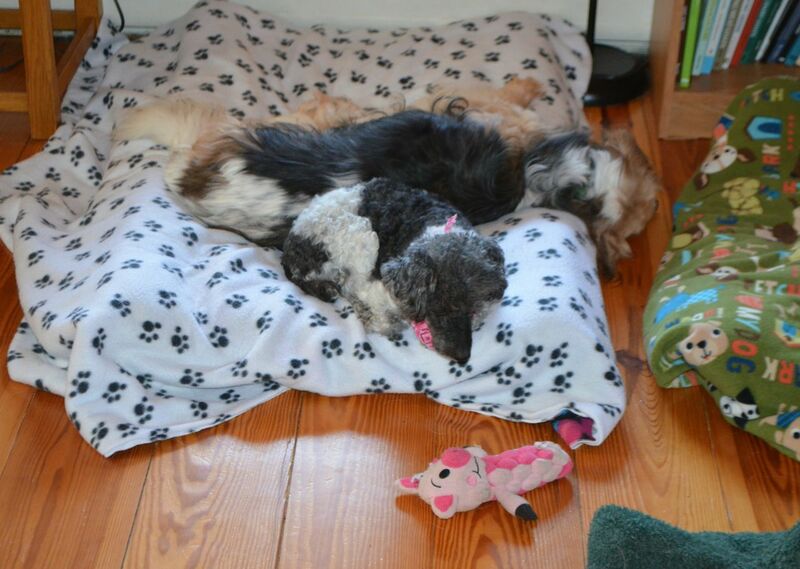 Esther certainly wasn’t going to vacate her own bed to Mabel, so she tolerated her presence. In both photos, you can see that Esther is stretched out across the middle, still “claiming” her bed, while Mabel is curled up small on the edge. It’s good that they’ve come to an understanding, and that Esther doesn’t have to mope and pout anymore. Glad to hear she’s feeling better now too. They must have a talk while you all were busy & decided it’s better to share. Love this story. Us old ladies figure it out sooner or later 🙂 So glad that Esther is back to her happy self! I’ve always wondered how y’all integrate new arrivals. Glad the girls worked it out. I hope all is well up there. The weather looks rough. enjoying life with a smile on her face. A triple win! I love your blog here, I just came across it …..I will do what I can to help you out on the Shelter Challenge……..there are still 4 more days! Yikes gotta go vote now!……..I am so excited for Esther, I hate to see any animal on meds (even humans) as the meds usually do more harm than good, not that this is the case all the time….BUT they really should be a LAST resort for all! I’m not totally against medication mind you, but I feel as if they are a “crutch” for a lot of doctors and even vets sometimes and I put vets on a pedestal most of the time! Going to VOTE, I hope everyone does the same! BEST OF LUCK! RDF has been moving up one step every week in the Shelter Challenge! !